Determined to lend assistance, Camille gets more than she bargains for when she is roped into helping Liam, a handsome British man, with more than just a ride. As they are thrown together over the coming days and their mutual attraction grows, they realize they just…click. That is, until she makes a shocking discovery: the mysterious stranger is William “Liam” Jones, lead singer of the popular band Gear. Camille has never been one to swoon over a celebrity, and she knows her and Liam’s lifestyles could never be compatible. But how can she convince her heart to listen to logic? 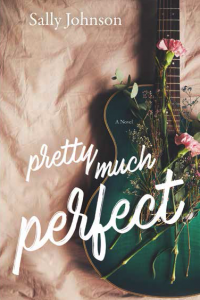 I’ve read Sally Johnson’s books before and really liked them, so I was really excited to get to read Pretty Much Perfect. And don’t you just love that cover?! This book starts off in such a great way, with Camille finding Liam on the side of the road half dressed. It made me want to keep reading until I figured out why he was on the side of the road in that state. And the reader doesn’t figure that out for a really long time. That makes this book so much fun! I loved Camille. She’s just a down to earth girl, recently returned from her mission. Camille’s wanting to be a person who sets up fund-raisers for others. I loved the way she’s always trying to help someone else. She’s just a great girl. And that’s a good thing, because she’s the sole point of view of this book. I love the way the author did that with this particular book. It makes the plot a lot more fun, because, like Camille, the reader doesn’t realize who Liam is. And that was a lot of fun! I liked Liam too! The way he was willing to respect Camille and all of the things she wasn’t willing to do, makes the reader realize that he is a good guy. I realized that way before Camille did, but then again, I had figured out a little more about him than she had too. It was fun to have Sophia from The Skeleton in My Closet Wears a Wedding Dress and Worth Waiting For make a small appearance in this one! I love getting a glimpse into the future lives of the characters I’ve grown to love in other books. This one has a fun plot. Camille never imagines all of the things that are going to happen to her before she meets Liam, but that’s all part of the fun of this one. Dating a superstar is never “normal.” There’s always going to be a little craziness. And it’s just a matter of whether Camille wants to deal with the craziness or not. What would you do? Anyway…for me this book was “Pretty Much Perfect.” I know that’s a bit cliche, but wow, I really loved it! This post contains affiliate links. This means that if you click my link and make a purchase, I may receive a small commission.